Well, its a lazy sunday and while surfing through my on-demand menu, i stumbled across this gem: Alienator [ IMDB , Trailer ]. Obviously, the name drew me in at once. I wasn’t sure what to expect, but turns out this is a terrible 80’s scifi action movie. The kind where the bad guys are wearing headbands over their mullets, the good guys are wearing space-uniforms with baseball caps, the doors are all outlandish shapes, and the soundtrack is 100% synthesizer. So far so good, I love me a cheesy 80’s flick. The cheesier the better. Simple plot: a prisoner escapes a space-jail and The Alienator hunts him down on earth. Unfortunately, this movie is about as SciFi as dirt. The first ten minutes are some pretty good ridiculous space scenes on the spaceship (just a made-over industrial warehouse) where all the computers are just blinking lights. But within 10 minutes the action shifts down to Earth, and the movie gets overrun with hillbilly’s and trailer trash chugging their Bud while driving down the road in their campers. And the biggest disappointment of all is there is no Aliens! 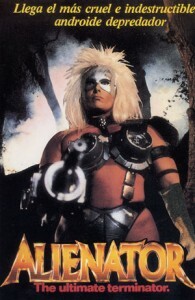 What kind of movie do you call Alienator without Aliens! Well, ok, I guess the Alienator was supposed to be an Alien. Turns out he was just some sort of David Bowie Action Hero she-male-robot hybrid decked out with a white hair-band wig, silver KISS make-up, and a cybernetic bra. I have to say that after sitting through this entire horrible movie, the climax made it all totally worth it. Now if only they would cut out all the back-woods scenes/actors, we’d have a good 15min of cheesy SciFi flick. If you’ve got a spare 20 min, watch the first 10 and the last 10 and you’ll be good. So if you’re the type of person that loves terrible movies (like I am), this is the terriblest! This movie was soooo bad.. I had to watch it again.. just to show my girlfreind so we could laugh at it.. really really stinky..it made me go out and rent “Plan 9 from outerspace” just to compare…. Wow, that might be next on my list!